The Boston Bruins and forward Anders Bjork have come to terms on a three-year entry-level contract, the team announced Tuesday. Bjork was originally drafted by the Bruins in the fifth round of the 2014 NHL Entry Draft and has made headlines for his impressive collegiate play at Notre Dame. Serving as an alternate captain with the Notre Dame Fighting Irish last season, Bjork broke out in a big way. His 21 goals, 31 assists and 52 points were all career-highs and earned the Bruins’ prospect recognition among hockey fans everywhere. While he may not have been a first-round draft pick, Bjork has thrust himself into a position where he now projects to be a top-six forward at the NHL level. No stranger to the limelight, Bjork had his fair share of accolades following the 2016-17 season. Named to the Hockey East First All-Star Team and a finalist for the Hobey Baker Award – given annually to the NCAA’s top collegiate player, Bjork proved to be a very good pick up by the Bruins in the latter half of the draft. It was an impressive season for the 20-year-old prospect who also put up 12 goals and 35 points in 35 games in his sophomore season in 2015-16. Though the Bruins managed to get Bjork signed to a deal, it wasn’t always certain that the events would unfold as such. With Notre Dame competing as one of the better teams in all of college hockey and Bjork leading the charge as one of the team’s best players, there was a belief that Bjork could remain with the team to make a push for a championship. This wasn’t the only concern, however. With the NHL announcing that players under contract would not be competing at the 2018 Olympic Games in PyeongChang, Bjork’s name was circulating as a potential player in the mix to compete. While playing in the NHL is often the dream of many, the opportunity to represent the United States at the Olympics was a legitimate cause for concern for the Bruins who made it clear that they wanted Bjork in the mix for the 2017-18 season. For the Bruins, Bjork’s signing now gives them a clear front-runner in their second-line left winger search. One of the team’s biggest needs heading into the offseason, the Bruins knew that a winger to complement David Krejci on the team’s second line would be imperative to the team’s success in the 2017-18 season and beyond. 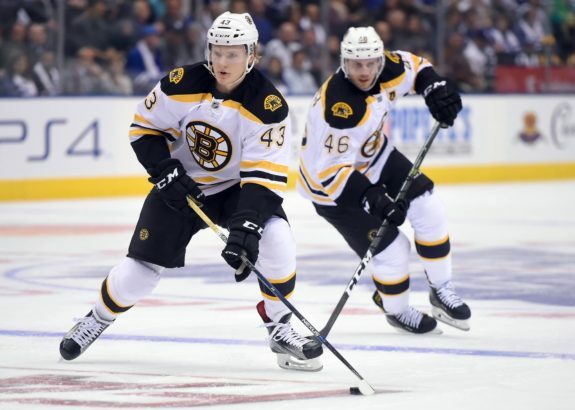 There were a few options for the team within the organization, including Danton Heinen, Peter Cehlarik and Jake DeBrusk. Outside of the organization, the Bruins had reportedly kicked tired on Colorado Avalanche’ forward Gabriel Landeskog, and it wasn’t out of the question that the team could revisit those talks in the offseason. Well, we’re doing everything we possibly can. He had a very difficult decision right after his season was over. I think it was overwhelming for him. He’s at the World Championships now. 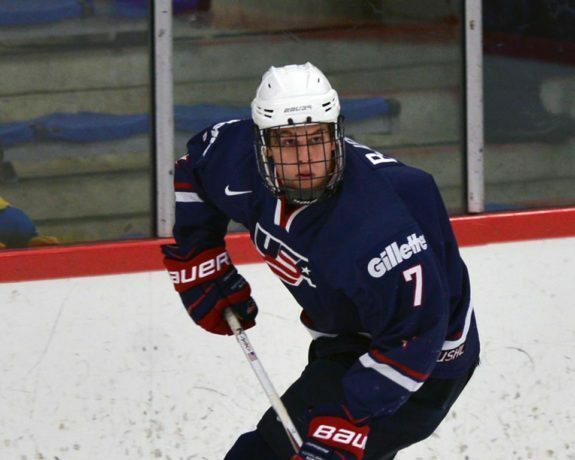 His camp has told (Bruins general manager) Don (Sweeney) that he’s going to make a decision whether or not to return to college hockey or turn pro after the World Championships at some point. So, our hopes are that he sees where we’re at as a team and some of the young players we’re putting in our lineup and we hope that he understands that he’s a player that we think very highly of that can step in and contribute here. Bjork and the Bruins were able to come to terms on a contract, which bodes well for his opportunities to compete right out of training camp. Making the transition from college hockey to the NHL may not be easy. In fact, the Bruins saw exactly that with Heinen last season. But there have been many players in the past who have made the transition seamlessly, and the Bruins are hoping that Bjork can be the next player to do so.